Merry Christmas 2017 from GeekOut South-West! ‘Tis the season to be jolly, but it’s also the season where you need to wrap up; so be sure to keep warm this Christmas Day. Of course, you’ll no doubt be unwrapping presents whilst you keep wrapped up, but as we uncover the mysteries of today’s article, we from GeekOut Media wanted to wish you all a Very Merry Christmas! 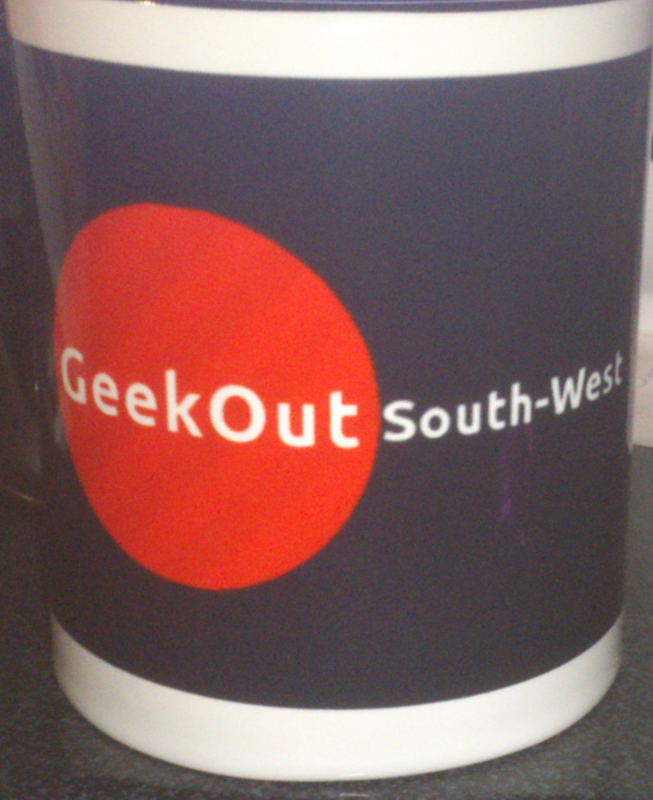 Season’s greetings from GeekOut South-West. Join Timlah as we look through Christmas 2015 and see what’s in store for 2016. SANTA GET AWAY FROM THAT TREE!!! Oh hi all, this is it you know? We’re at the end of the year and we’re about to see Christmas 2015 just pass us by like a gentle breeze. It’s oddly warm for this time of year here in England, so the science buffs amongst you can tell us reasons for this down in the comments below. Now that’s out of the way with, what have we been doing and what’s in store for the New Year? This past week, I was at my sisters’ wedding after party in typical costumed fashion. I made a tricorn hat, with a crocodile tooth pattern and the brim of the hat was lined with feathers. I had to wear high heels and tights. I had to wear a large coat and a jabot, who on earth could I possibly have been cosplaying as? 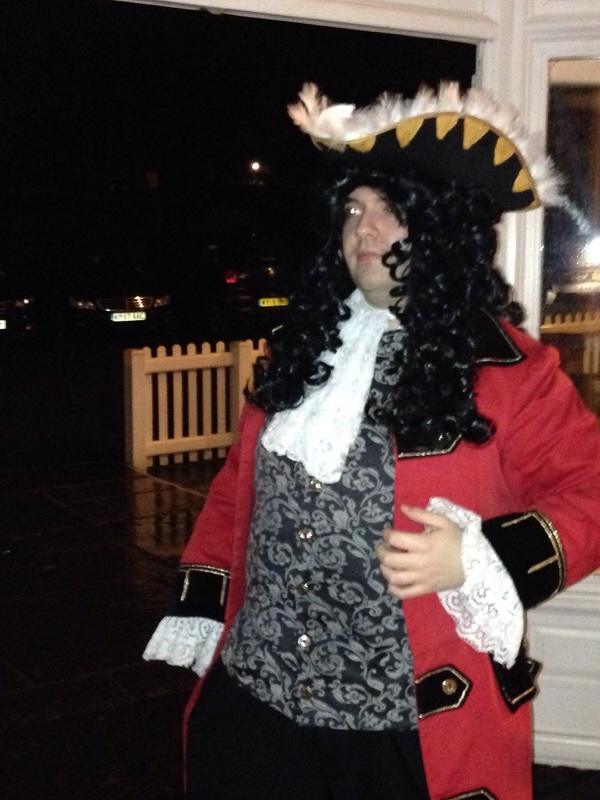 Well, of course, it had to be Captain Hook! The coat, waistcoat and jabot I actually rented from a small business here in Bristol called Fancy Dress Fanatics. They are a brilliant company who stock many wonderful costumes. Please do go and check them out. I took a few pictures of their store when I was in there (With their blessings), so you can see for yourself just how well stocked they are. They were incredibly well priced at £25 for the three pieces for rental and the staff were very attentive. They knew what worked with what and where everything was. I had many people comment on the quality of the outfit, from the coat, to the attention to detail of the hat. Sadly, I had no eye-liner available nor any way to stick a ‘tashe and eyebrows to my face in the short time I had to get changed, but I am pleased with the result. Once the night was over, all I had to do was make sure all of the costume pieces were in good condition, on their original hangers and back in the bag. Popping in to see them was nice and easy and the deposit was £30 (as an incentive for you to bring the outfit back!) I really enjoyed wearing the outfit and we got some great pictures out of it. So that’s what I was up to on Monday hence I didn’t do my usual post slot (Thanks Joel for picking up my slack!) Then yesterday, we had the incredibly talented Chris Lock do his second post on his Replacing the Mighty Keeper series. If you’ve not read these articles yet, I really recommend you do. He’s going through Dungeon Keeper-like games and reviewing them, comparing them to the real deal. We’re going to record a video of us playing Dungeon Keeper, too. Both Joel and I are really into the spirit of the season. In fact, just yesterday, I was sat in work with a Hawaiian Santa shirt on and a Santa hat, so clearly I’ve been infected with the good tidings and cheer. Because we’re so in the mood of the season, we went ahead and bought a Christmas present for one another. I received a mug from Joel which says something that is similar to “Worlds’ Best Boss” except it was the exact opposite of “best”. I meanwhile went for a more neutral “Worlds’ Okayest Employee” trophy for the guy. Merry Christmas Joel! Over the holidays you may have seen we’ve not stopped our post schedule. We declared we were going to have an article out every single day and we’ve not let you down yet. There’s a post associated for every day on GeekOut, so we’re doing something right. Even if one or two posts (especially around convention seasons), were just place holder posts for the real thing to happen the following day. We’re always keen for feedback, so please let me know if you’ve got ideas for what we could or should cover here on GeekOut. Next week, we’ll have finally finished 2015 and it’s been a roller-coaster of a year for us all. There have been some seriously great moments, but please take a step back to remember some of the tragedies of the year. With the terrible bombing of Paris, to the Syrian refugees, we’ve seen some dreadful things occur in the real world. It’s rare I bring the real world into an article here on GeekOut, but we’re aware these things happen and I would implore all of you to do your bit you’re your local communities where possible. Remember people are people, regardless of what your political views are. I don’t want us to be GeekOut South-West forever. In fact, we’ll be looking to move over to a brand new name: GeekOutUK. I’ll be retaining the GeekOutSW.com domain which’ll link you directly to GeekOutUK.com. It’s a small change that makes a big difference. 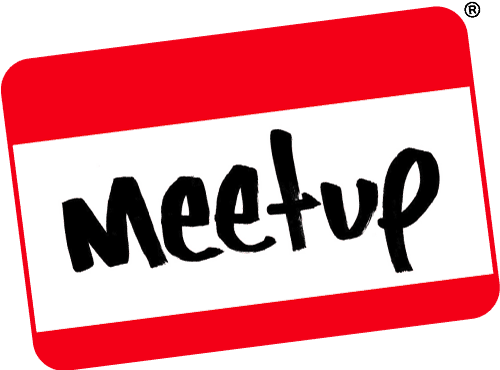 We want to be all inclusive: we want to be UKs top geek community. Coupled with that, I want to start developing this site away from WordPress.com and make a dramatic move over to WordPress.org… But I don’t want to lose what we already have. I’m working tirelessly these days to improve the website and keep producing content, because I believe what we have and what we can have is something truly special. This isn’t a comprehensive list of what we’ve got planned. Some of the website changes we have planned for early-to-mid next year is simply huge, but because of how big some of them are, I don’t want to tell you about them until we’ve actually gotten them confirmed… But next year, we’re making some changes around here – We want this site to be more interactive, more accessible for you all to take part and we want to build on our existing community and then some. From the GeekOut team: Merry Christmas one and all! Chat to us, respond to this article in the comments below, or over on Facebook and Twitter. Since we’re so close to Christmas now, I thought it was time for me to look through and see if I could find any Christmas themed manga. I mean, how hard could that be? Christmas is a huge topic, which has hundreds of products that sell very well. It’s a commercial success as well as being a culturally important day. So, how hard was it to find a Christmas themed manga? Very! However, after much seeking around the internet, I managed to find one called Merry Unbalance Christmas. I just wanted to make a quick blog post wishing each and every one of the readers of GeekOut a very merry Christmas. So, how has your Christmas gone? So far, I’ve had a wonderful meal and of course, sharing and opening of gifts amongst the family. I received some vouchers as part of my gifts, which are for Fabricland in Bristol. They sell yard after yard of great quality fabrics of which I will need for my Edward costume. Speaking of which, I received my Edward Elric wig and his pocket watch. Excellent! I’m getting my costume pieces (Slowly). State Alchemists are issued a pocket watch with the state alchemist insignia as identification. Spiffy! One day, I feel I should learn how to make my own wigs, but that is very far down the line yet. I have plenty of beers in stock, so today will have to be an inventive day, I feel! I wonder what will be made by the end of the day?! Enjoy the holidays everybody, why not share how your holidays went? Related articles – Merry Christmas all!